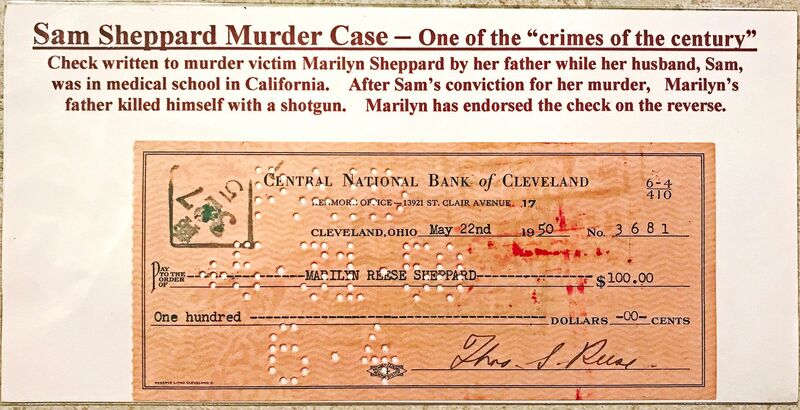 Sam Sheppard Murder Case-"Crime of the century"
Home > Americana & Unusual > Sam Sheppard Murder Case-"Crime of the century"
Wife of Sam Sheppard, the Ohio doctor who was accused, tried and convicted of brutally killing his wife in 1954. His story of a ‘brushy haired intruder’ was not believed, and Sheppard served 10 years for a crime he steadfastly denied committing. Sheppard was eventually released from prison after an appeals court ruled he was denied fair trial due to heavy publicity. His story was later the basis for the television series and movie "The Fugitive." Bank check, 6.25 x 2.75, filled out in type filled out in type and signed by Marilyn's father Thomas Reese, payable to "Marilyn Reese Sheppard" for $100.00, on May 22nd, 1950. Homicide victim. Marilyn Sheppard, wife of Dr. Samuel Sheppard, wealthy Cleveland physician, who were both principals in a crime that baffled Cleveland police and became a national media circus for over sixty years. Marilyn, was found brutally bludgeoned to death, succumbing from between 20 and 30 blows on the head in the couple's lake shore home in Bay Village. (a suburb of Cleveland) The couple's seven year-old son, Sam Reese, was asleep in the room next to his mother's during the murders. The doctor himself was badly beaten but revealed to police a story of grappling with "one or two men" before being knocked out while sustaining serious injury to his head and neck. Evidence pointed to his guilt. He was convicted of second degree murder and sentenced to life in prison. Marilyn was born and raised in the Cleveland area and attended Cleveland Heights High School where she met Sam and they dated. After graduation, he was off to Los Angeles to attend the Osteopathic School of Physicians and she to Skidmore College in Saratoga Springs, Florida. Upon Sam's return to Cleveland, he became affiliated with the family operated Osteopathic Hospital in Bay Village and they were married. With the purchase of their first home located on a high cliff over looking the Lake Erie shore in Bay Village, a semi-elite suburb of Cleveland, Marilyn settled into the life of being married to a physician. She became a mother, homemaker and taught Bible classes at their Methodist Church. The couple, both sports enthusiasts, spent their leisure time playing golf, water skiing, and having friends over for parties. Sam and Marilyn's marriage seemed free of problems, but in truth, it was suffering due to Sam's infidelities. Divorce was never discussed and they worked to revitalize their marriage. Then tragedy struck. On the night of July 4th, Marilyn, who was four months pregnant, and Sam entertained neighbors until midnight. After the guest left, Sam fell asleep on the couch and Marilyn went to bed. Awakened by what he thought was his wife calling his name, he hastened to the bedroom and saw a bushy haired man fighting with his wife. He was immediately struck on the head, rendering him unconscious. Marilyn was gone at age 30. Her funeral was held at the Methodist Church in Bay Village. Dr. Sam was taken to his wife's funeral in a wheel chair wearing an orthopedic collar. He wept bitterly during the eulogy. The strange decades lasting aftermath had begun....Three plausible theories have immerged over to years in an attempt to identify the killer. Sam Sheppard's version of the killing for which he was convicted, did not stand up during a second trial and he was acquitted. He was a broke alcoholic at the time of his death but still maintained that a bushy-haired burglar had killed his wife. Richard Eberling a window washer who was in the house a day before the crime is considered the culprit. Later he was convicted of killing an elderly widow, however, maintaining until his death in prison, he had no complicity in the death of Marilyn. Sam Sheppard in his initial statement to police claimed a confrontation with two individuals. Bay Village Mayor Spencer Houk and his wife, next door neighbors, fit this scenario and had a motive. This was presented to the grand jury but no indictments were handed down. The couple has since died.